Eligible Candidates can Download CDS II Written Exam Admit Card at the Official Website of UPSC. Open Admit Cards Link at Home Page. 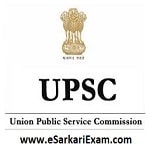 Now Open Admit Cards for Various Exams of UPSC Link. Open CDS II Admit Card Link. Click on Download e Admit Card Link. Read Instructions & Click Yes Button. Download Admit Card by Using Reg ID/ Roll No. Fill Required Details in Empty Fields.